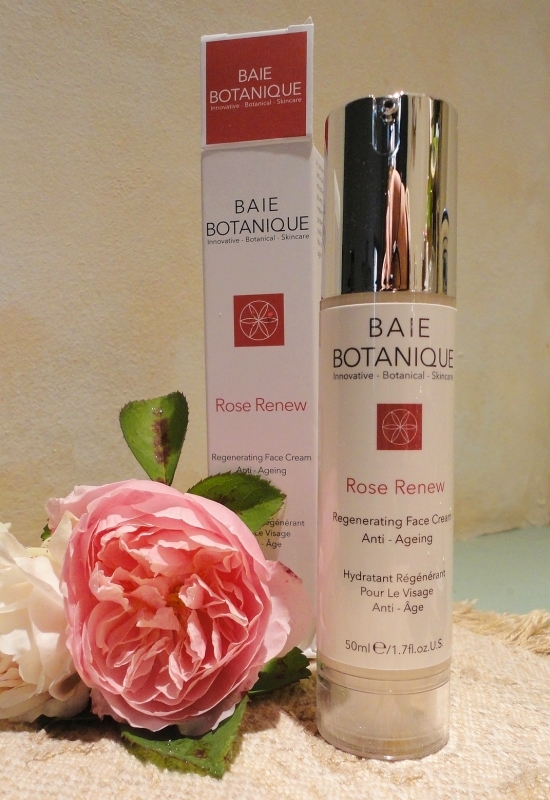 A fairly recent brand of rose-based skin care made in France, Baie Botanique uses only natural, mostly plant-based ingredients, free of artificial scents and colouring, and without toxic additives. They may be new but everything I read about them reassured me: solid science, powerful botanical and, mostly organic ingredients, no parabens or other nasties, full money-back guarantee and, very important to me, no animal testing. This product was sent to me for test and evaluation purposes. It has the same mesmerizing rose essence as the serum and anti-ageing cream, a perfume that I find soothing and delicious. I grow antique roses and these products remind me of the Damask Rose scent of Kazanlik and Ispahan, which is not surprising looking at the list of ingredients. Right at the top is Rosewater, but also Rose Absolute (rose petal essential oil obtained through solvent extraction) and Rosehip Seed Oil, together with a particularly rich mix of botanicals and powerful anti-ageing and skin improving natural ingredients. Rose extracts have a purifying and balancing action so they are beneficial for all types of skin, especially mixed skin like mine. The soft tube contains 125 ml of gel, which is a bit more than comparable products. The gel is clear and viscous, and suds easily on moist skin. I use a Konjac sponge to maximise the deep cleansing action. It rinses well in clear water and leaves my mature skin clean and refreshed but not dried out. As with all face wash cleansers, I don't use it to remove eye makeup but afterwards, to get all oily residue off. I have been using this gel for five weeks now, twice a day, and my skin looks tight and free of blemishes, and I notice very little shine in my T-zone. Considering that my skin care products have been of excellent quality for three years now, I would say that this is easily among the top gel face cleansers I have ever used. As usual my husband has also tried it, and what seems to be a fairly strong flowery scent reacts well with his body chemistry, turning into a fresh and clean, unsweet base note. Judging from my usage, I expect the bottle to last at least two months, so great value for money. Having previously evaluated this brand's Rose Renew Serum, I was very happy to be offered a review sample of the new Face Cream. Fortunately, I had some serum left so I was able to try the two together, which I think is the best way to maximise their action. However, even by itself, this luscious cream is one of the best I have tried in years. From my study of essential oils and natural skin care ingredients, I know that extracts and by-products of Rosa Damascena are the best ingredients to improve any kind of skin. In the long list of ingredients, I noticed Rose Water, Rose Absolute and Rose Hip Oil. In fact, that list includes pretty much all the most powerful plant-derived extracts known to benefit skin. I can only marvel at the experimentation that must have gone into producing this formula! As my combination skin has become more sensitive and fragile with age, I have to be careful of allergic reactions and aggressive ingredients. Baie Botanique uses only natural, plant-based ingredients, not tested on animals, and free of artificial scents and colouring and toxic additives. All of this is paramount for me, as I try to use exclusively natural skin care. I tested the two Rose Renew products together for a month - which is the bare minimum to form a useful opinion, since our epidermis takes about 4 weeks to fully renew itself. Sure, you can use a new cream and know within a few days whether or not it agrees with you, but to fully observe any change, more time is needed. On my face, this cream is superb. It instantly tightens surface lines (Rose Water is a gentle but effective astringent), and then softens and “fills” them. It's a subtle change but so welcome. I am also delighted with its versatility. It is one of the very few creams that I can use under make-up without ending up with oily patches. This cream is well tolerated even on the tender skin under my eyes and on the eyelids, so I can use it in place of a specific eye product. At night the combination of serum and cream forms a perfect base for a heavier active moisturizer and, again, the gentle but effective ingredients seem to meld well with my other creams. It's really fabulous and I adore using it; the scent is delicious and my husband always seems to notice it, thinking I have put on a rose-based perfume. And lastly, the beautifully clean packaging: a plastic bottle with a pump dispenser to keep the contents (50 ml) free of contaminants. Only a few pumps are needed to cover my face and neck, usually four or five. After a month of twice-daily applications, I still have some cream left. This is one I will buy again once my sample is finished. This serum is something special. I adore skin care based on rose extracts, and this serum is the most concentrated product of this type to come my way. Proposed to me for evaluation and review, it has blown me away with its intense aroma and visibly toning action. Two pumps is all I need for my whole face and neck. The serum is very liquid and penetrates really quickly, so much so that I can often go over the same area (like around the eyes) adding more. It has a pulling and firming action which seems to instantly diminish the appearance of deep lines and wrinkles. My face is then more than ready to accept the nourishing and hydrating cream I happen to favour at the moment. Whatever I apply, it will sink into my skin much more easily than without the preparatory step of the serum. 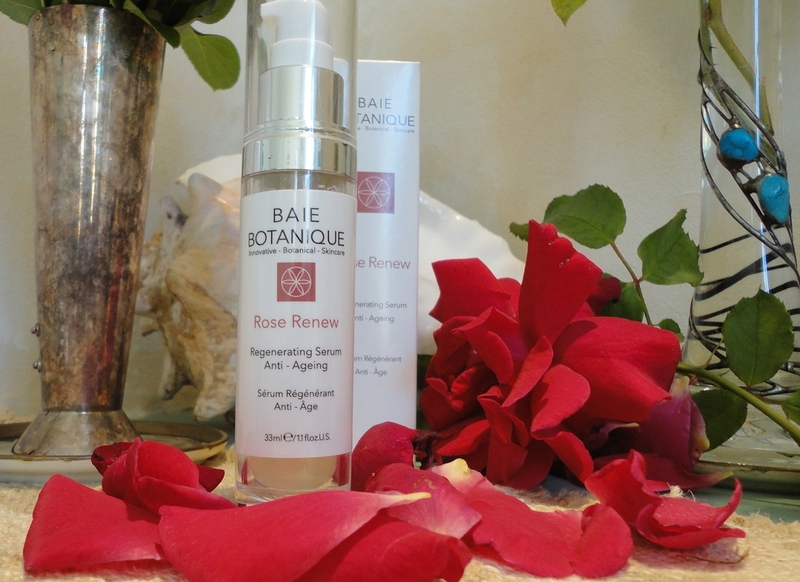 Something else which is typical of rose extract is the purifying action on skin impurities. My mixed skin appears to be coping well with the drying effect of sun and wind, and I notice very little shine in my T zone. I also find this preparation very soothing right after derma rolling, when my skin is somewhat tender. 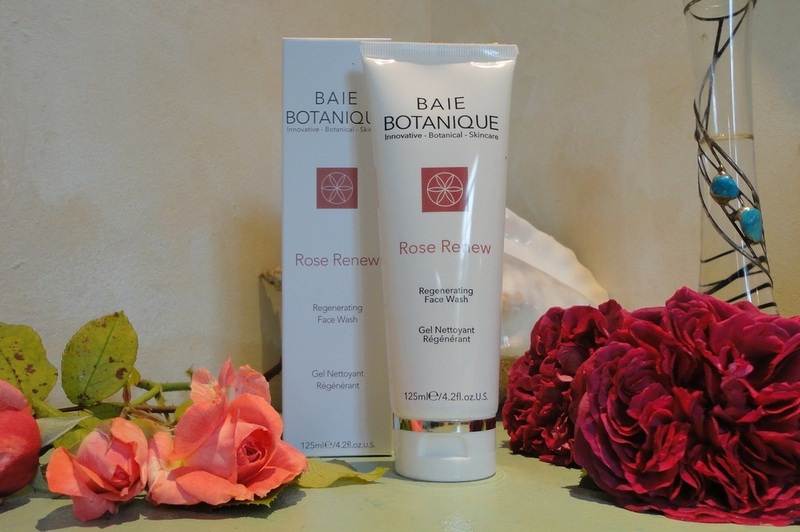 The formulation of Rose Renew includes 10% Hyaluronic Acid (anti-ageing ingredient par excellence), Rose Water, Rose Absolute (rose petal essential oil obtained through solvent extraction), Rosehip Seed Oil, MSM, Kojic Acid and Glycol Acid (these last three help with skin discolouration and loss of elasticity, and minimize the appearance of lines and wrinkles). After three weeks of regular use, morning and night, I'm really pleased with the condition of my skin. I have been using top quality skin care for over two years, so my gauge of effectiveness is to see my skin looking as good as before, which is certainly the case with this serum. The other, even more important test, is that my face looks fresher and more hydrated AFTER the serum as compared to how it looks when I get up. The toning and perking-up effect is very noticeable. The clean-lined plastic bottle holds 33 ml (slightly above the usual for a face serum) and the pump works very well to accurately dispense the liquid. The current price (less than £22 or €25) is extremely reasonable for such quality and a fraction of comparable products from well-known brands. Based on my usage, I expect the bottle to last three months, which makes this great value for money. Definitely one I will be buying again once my bottle is finished.